Thuro has the technology to burst a brand new pipe of the same size right through your existing one to permanently fix any root blockages, sewer cracks, broken pipes, and ovalling no corrode. 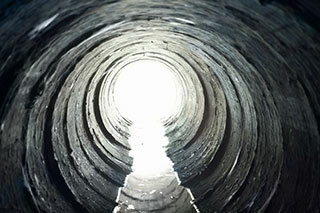 If you know or suspect your sanitary line is failing, call today to book a video inspection of your sewer line. Pipe bursting and other trenchless technologies repair your broken or failing sanitary line without digging up yards so decks, trees, and gardens look just as great as they did before. Unlike some more traditional methods of pipe replacement, pipe bursting utilizes fused joints which completely eliminates potential root issues so you can enjoy a lifetime of trouble-free operation. Unlike many other contractors, Thuro is an indemnified contractor with the City of Calgary. Why is it so important that your pipe bursting contractor is indemnified? Not only can Thuro fix the sanitary service up to your property line, we can also legally replace sanitary services all the way to the main, fixing the entire line all at once. We will even contact The City of Calgary and propose a solution to fix the City side at no cost to you. Pipe bursting with Thuro is a proven and time-tested permanent fix for your sanitary line problems. We are also equipped to burst in a new water service at the same time as your sanitary. Give us a call today, we would love to discuss how pipe bursting can work for you.